Twins starting pitcher Andrew Albers delivers a pitch in the first inning against the Cleveland Indians at Target Field last season. Albers is currently weighing whether or not he should play in South Korea this season. 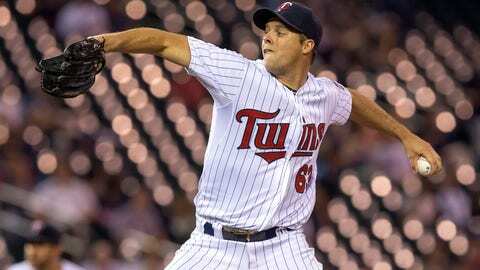 MINNEAPOLIS — Twins pitcher Andrew Albers could soon be Korea-bound. Albers has been in talks to play for the Hanwha Eagles of South Korea, his agent Blake Corosky, confirmed Tuesday. The 28-year-old Albers made his major league debut with Minnesota this past season and was 2-5 with a 4.05 ERA in 10 starts for the Twins. Corosky said the Eagles initially contacted the Twins about Albers pitching in Korea this upcoming season. There’s still the issue, however, of Albers’ Twins contract being bought out before he can head overseas. "Regardless of what we want, things have to be worked out between the Eagles and the Twins," Corosky said. A Saskatchewan native, Albers’ journey to the major leagues was well-documented last season. He played college ball at the University of Kentucky and was drafted by the San Diego Padres in the 10th round of the 2008 draft. He spent just one season in the Padres’ minor league organization before missing the 2009 season with an arm injury. From there, Albers spent a year in the independent CanAm league with Quebec before joining the Twins organization for the 2011 season. After working his way up through the minor league ranks, Albers reached the majors in 2013. Even though the left-handed Albers doesn’t possess overpowering stuff — his fastball rarely touches 90 mph — he was effective during his handful of starts. But now that the Twins signed three free-agent pitchers to join Kevin Correia on the rotation, competition for the fifth and final starting job could be fierce this spring. Given that scenario, Albers may have a better opportunity to pitch in Korea than he would if he stayed in the United States. Corosky said that even if a deal gets done in the next few days, Albers will still attend Thursday’s Diamond Awards — where he’ll receive an award as the team’s Minor League Pitcher of the Year — as well as this weekend’s TwinsFest at Target Field. "We’re sort of in a holding pattern," Corosky said. "The Twins organization through this whole thing has been unbelievable. Really understanding and always open to his phone calls or my phone calls as far as questions go. . . . They are, in my opinion, the exception to the rule as far as most baseball clubs go."